Addressed to the police or security, this printable complaint reports the theft of a bicycle. I would like to report the theft of my bicycle. 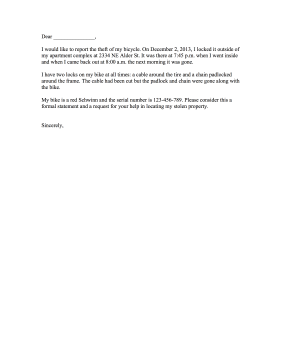 On December 2, 2013, I locked it outside of my apartment complex at 2334 NE Alder St. It was there at 7:45 PM when I went inside and when I came back out at 8:00 AM the next morning it was gone. I have two locks on my bike at all times: a cable around the tire and a chain padlocked around the frame. The cable had been cut but the padlock and chain were gone along with the bike. My bike is a red Schwinn and the serial number is 123-456-789. Please consider this a formal statement and a request for your help in locating my stolen property.